The Note9’s been has been out for several months now, but unfortunately we never really did get to reviewing the phone. A big question from a lot of our community members that kept coming up is whether we’d redo testing of the Snapdragon vs Exynos models of the Note9, and see if there would be any major differences between these phones and the results we got earlier in the year on the Galaxy S9s. While it took a while, I’ve finally got my hands on both variants of the Note9, and we can finally deliver on the results of our testing. This piece isn’t a full review of the phone itself; here there’s really no doubt about Samsung’s overall quality of the phone as the Note9 continues the excellent results of the Galaxy S9 in categories such as design, build quality, display as well cameras. For camera results I’ll refer to my more recent device articles such as the Pixel 3 or Mate 20s review where the Note9 is included. We’ve covered the key aspects of the Note9 in our release article. This year, the two most notable features of the Note9 are the inclusion of a new bigger battery, coming in at 4000mAh as well as an increased maximum storage capacity of 512GB. The new S-Pen also has gained wireless connectivity which allows it to control various configurable features on the phone. The new feature means that the S-Pen is no longer a passive component, but rather a powered one. Samsung implemented this in a very interesting way: the S-Pen now draws its power from a capacitor instead of a regular battery. What this allows the phone to do is charge the new pen in seconds when docked into the device, rather than the more extended charging times that are required for lithium batteries. As in the Galaxy S9s, the Note9 is again dual-sourcing the SoC from Qualcomm as well as S.LSI. This has been a big discussion topic for me this year with our coverage of the disappointing results of the Exynos 9810 variant of the Galaxy S9. While over the last few years we’ve been used to seeing differences between the SoC variants, they’ve never been as great as this generation. We’ve extensively explained as to why this happened in our review of the Galaxy S9 as well as follow-up articles centring on the 9810’s software. One big critique of the results back then was that I only had a smaller Exynos S9 versus the bigger Snapdragon S9+, somewhat blurring the differences to some people. Today’s results Note9 results are on the same device model, so hopefully comparisons will be more straightforward. In our web browsing battery test, the Snapdragon and Exynos Note9 surprisingly end up within margins of each other. In absolute terms, both units showcase outstanding results just shy of 12 hours, only really being beaten by our more recent result of the Mate 20. This is an excellent improvement over the results of the Exynos S9 back at release. In my piece altering the S9’s kernel and scheduler, I showcased that performance as well as battery life could be improved just by altering the behaviour of the software. The one thing that made the greatest improvements in both aspects was the removal of the 2.7GHz boost of the big cores. Over the summer following that article I had made some further improvements software wise, as well did some digging into the battery of the S9: For some reason, Exynos S9’s are shipping exclusively with a battery model “EB-BG960ABE” while the Snapdragon variants all exclusively were shipping with “EB-BG960ABA” batteries. The two models come from different factories. There was one discrepancy that bothered me here: the fuel-gauge on the small Exynos S9’s were consistently showing smaller nominal capacities than the Snapdragon S9’s while both have the same charger and fuel gauge IC. I ended up ordering a fresh set of both battery models and replaced them in my S9 unit, and skipping over a lot of technical details about how the fuel-gauges work, the end result is that the ABA models do seem to have a 5% better longevity over the ABE models. Overall I managed to raise the battery results of the S9 in our web test from 6.8h up to ~8.8h all while improving performance. 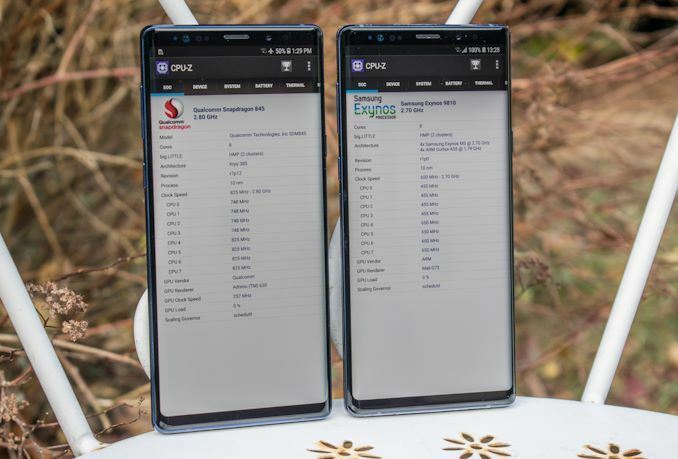 The Exynos Note9’s 11.66h here represents a 32% increase – something quite in line with the 4000mAh vs 3000mAh difference of the two phones, barring of course software differences and the fact that the Note9 has a much bigger screen. Do keep these results in mind while we talk about performance on the next page. 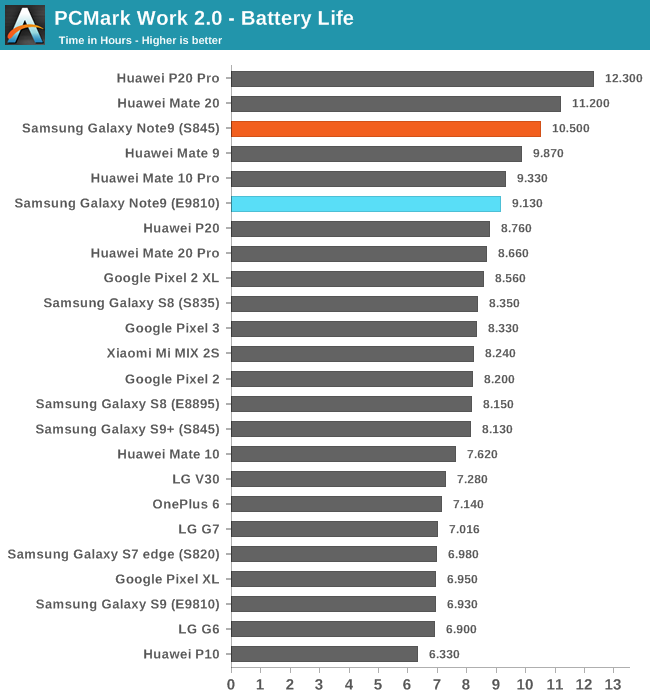 In PCMark, the Snapdragon Note 9 retains a notable lead in battery life, with the Exynos Note9 coming in at 15% behind it. 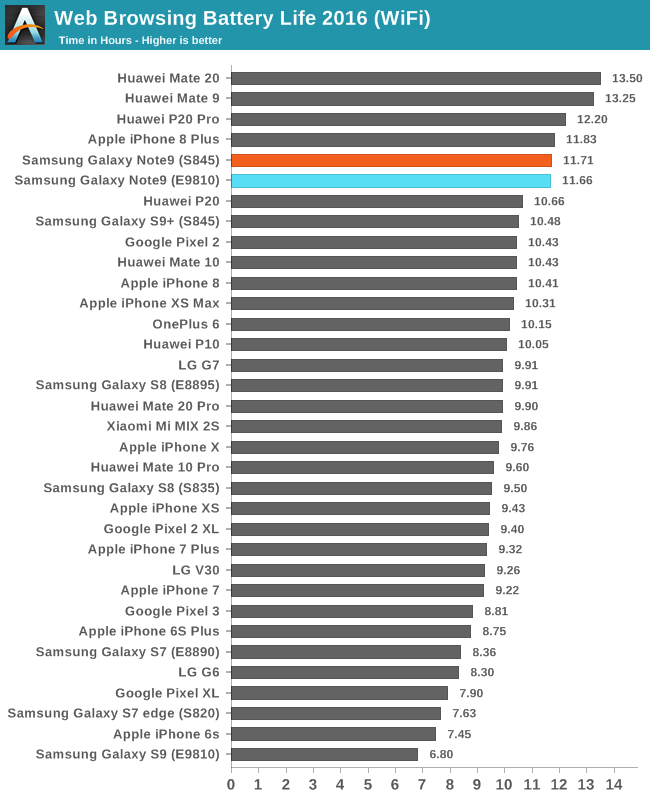 Again the Exynos Note9 fares 32% better than the small Exynos S9 on stock firmware, in line with the battery capacity difference but not in line with the screen size differences of both devices. At first glance, it seems that Samsung has largely resolved the battery differences between the Snadpragon 845 and Exynos 9810 units of the Note9. However as I’ve hinted at several times now, things aren’t quite as straightforward as to what it cost to achieve this. Next up we’ll investigate the system performance of both Note9s. hi andrei, as always a great in depth analysis! 1. would you tell me the avg. power consumption peak of A9 until A10 on t-rex and manhattan 3.1? because i curious about development of apple in term of gpu efficiency and how apple A9-A11 compare with other gpu like adreno and mali. 1. I don't have an accurate way to measure power on those devices and won't be investing time to get back to them. The R&D + manufacturing cost is probably less than what QC sells them a Snapdragon package for. "Why is Samsung even still trying to make Exynos work?" To decrease reliance on other companies if they need to, and also keep pressure on the companies they do work with.